Twinkle Polar Bear Musical Water Globe available from The Music Box Shop, Bristol. A musical waterglobe with polar bear theme. 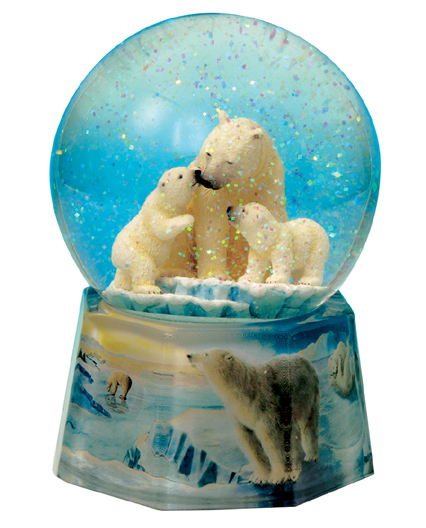 This musical water globe has a mother polar bear tenderly watching her two young cubs as they play in the snow, which is mounted on a highly decorative base with an icy glacier theme and other polar bears. Wound from underneath, the clockwork musical box movement plays "Winter Wonderland" as the polar bears turn within the globe, if you turn the globe upside-down the glitter and snow bellows within the globe. IMPORTANT NOTICE - Our range of waterglobes are mostly made from a cast resin, The musical waterglobes are for decorative purpose only, they are not toys. They are a collectable figurine, so children should be supervised if handling them, If you are unsure about suitability, please ask one of our staff for guidance.